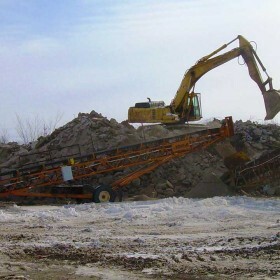 Environmental Remediation - The Great Lakes Construction Co. The Great Lakes Construction Co. is one of Ohio’s largest Heavy Civil Contractors. 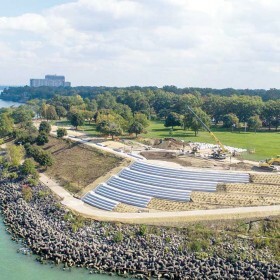 In business for over 60 years, Great Lakes has performed projects for federal, state, county, community, industrial, commercial, and private residents. As a result, we have developed a diverse range of core competencies. Listed below is a sampling of some recent projects completed in Environmental Remediation. Millennium Inorganic Chemicals, Ashtabula, Ohio – contaminated soil remediation at this Superfund Site. Lakeview Bluffs, Hemisphere Corporation, Painesville, Ohio – site remediation through excavation and removal of contaminated soils. Former Steel Slitting Building Demolition, Third Federal Savings & Loan, Cleveland, Ohio - complete removal of building, excavation, and site preparation. Site Remediation and Earth Retention, Flats East Development, LLC, Cleveland, Ohio - excavation and disposal of petroleum impacted soils, removal of foundations, and installation of an 18,000 SF earth retention system with tiebacks. Former FirstEnergy Plant C, Ashtabula County Port Authority, Ashtabula, Ohio - site remediation, including settling pond clean-out, Air Pollution Control Device clean-out, and excavation and removal of contaminated soils. Steelyard Commons, First Interstate, Cleveland, Ohio – above- and below-grade demolition, contaminated soil removal, site preparation and grading of former 120+ acre LTV Steel Brownfield site. 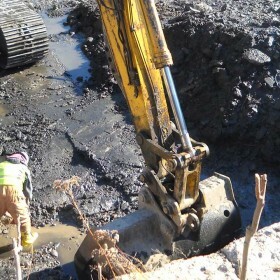 Sheet Pile Cell and PCS Remediation, BP, Cleveland Clinic Foundation, Cleveland, Ohio – complete excavation and removal of petroleum-contaminated soil to a depth of 20 feet below grade utilizing a sheet pile cofferdam. We would welcome the opportunity to work with you and your team. Please contact Ken Eshler by phone at (330) 220-3991 or email keshler@GreatLakesWay.com to discuss your specific needs.